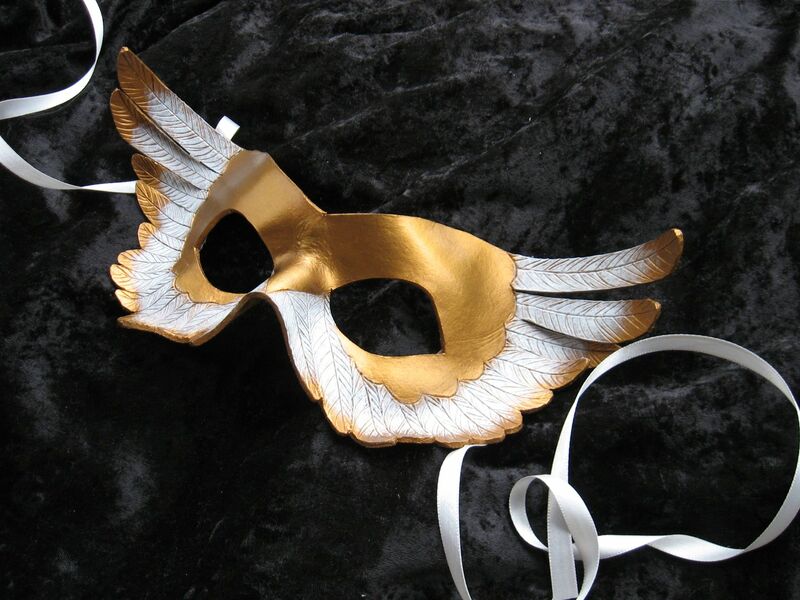 A few wing-themed designs, for the creatures of darkness and light out there. 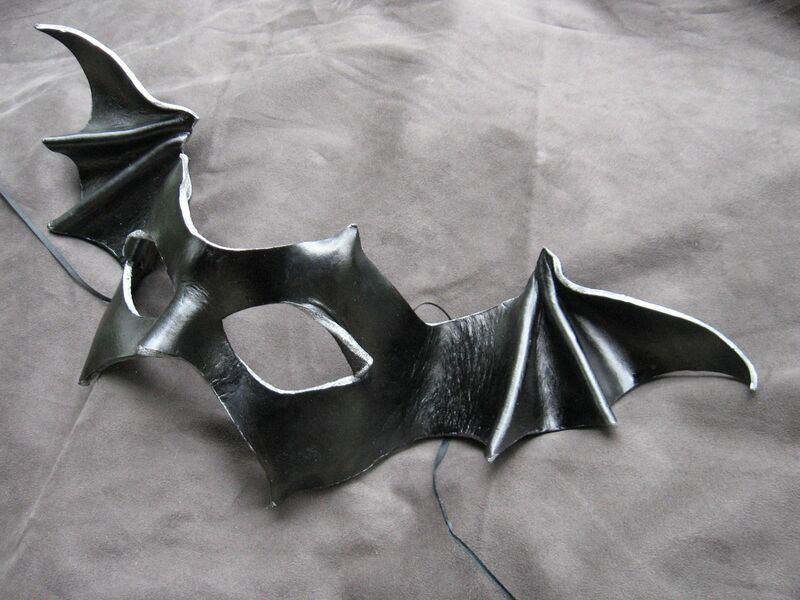 These put me in mind of a masked ball, but I think they could work for any number of occasions. 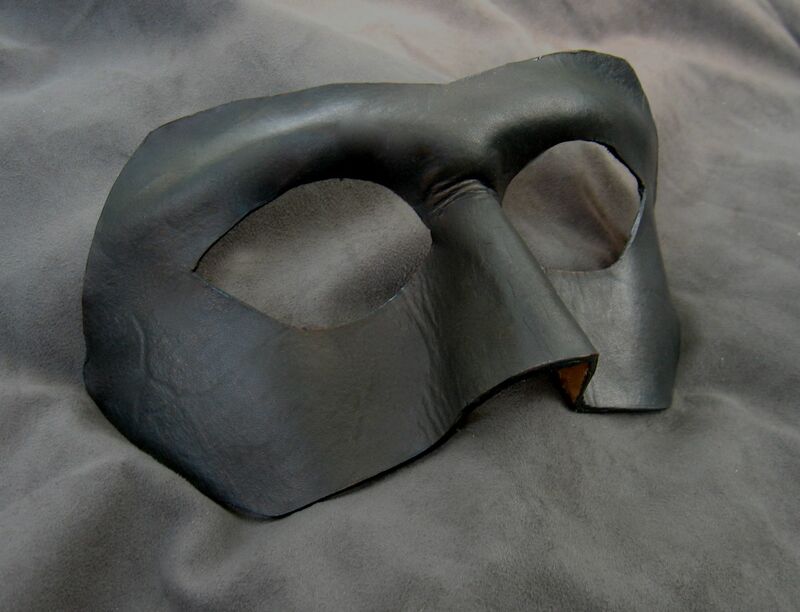 This one would suit an elegant demon or vampire quite well, I think. 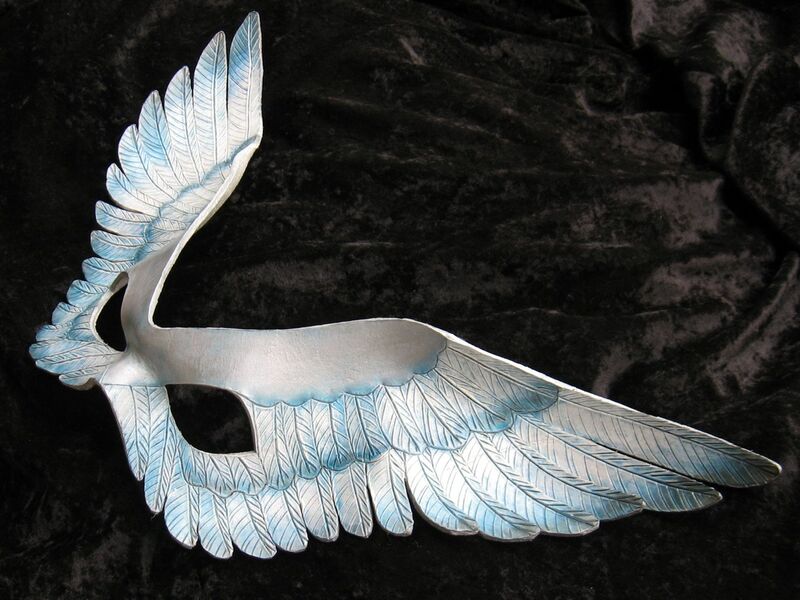 I think of this one as the Valkyrie- severe angles, shimmery, icy colors, and a truly epic wingspan- 17 inches! 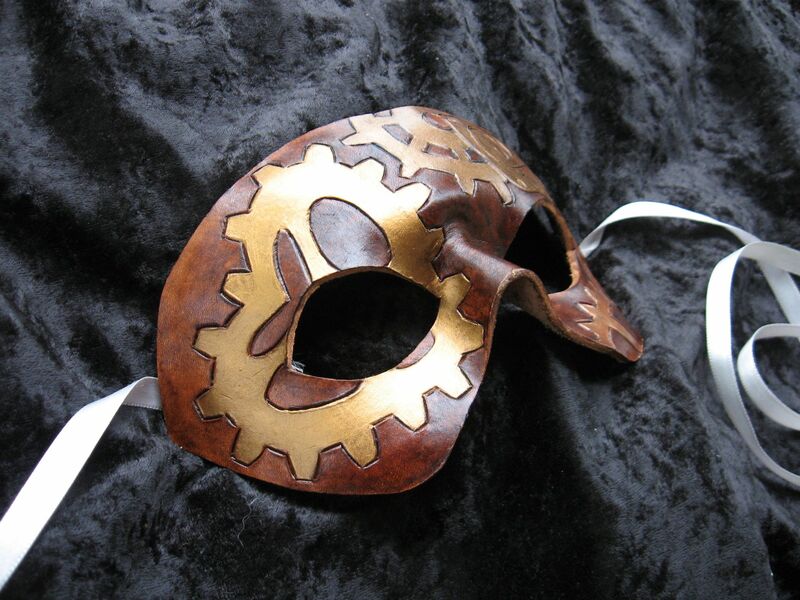 A couple of fun little designs I did for the Steampunk-themed Time-Travelers’ Ball at Dragon*Con a few weeks ago. 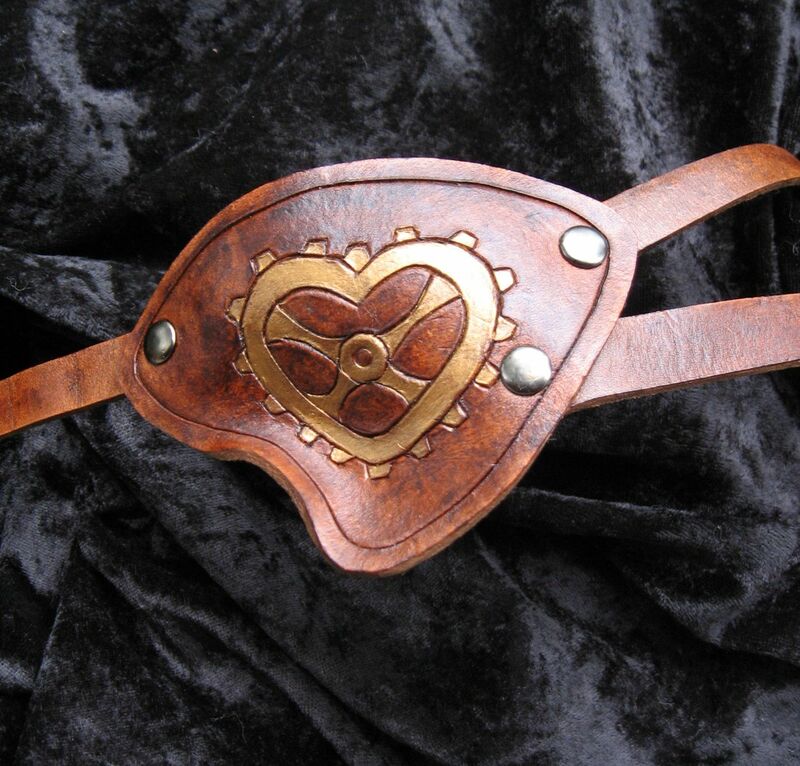 These are on the simple side, but I’ve got some more elaborate ideas along these lines that I hope to explore later. Playing with rich brown dyes and sparkly metallics is way too much fun. 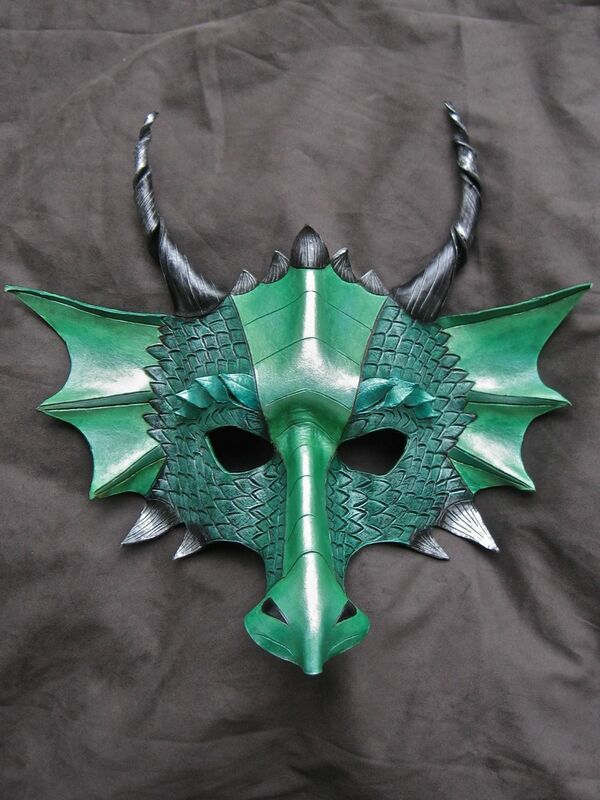 This is one of the new designs I did this week, a shimmery dragon mask in shades of green. 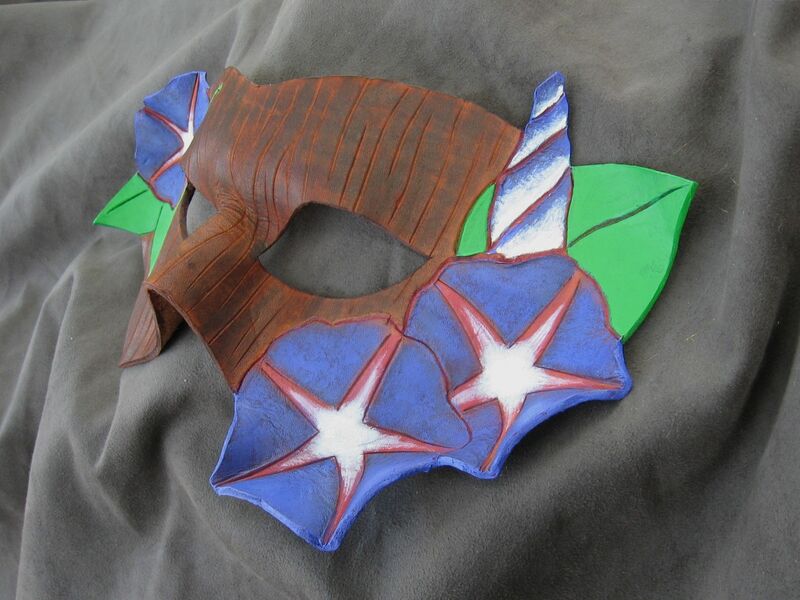 This was a fun way to experiment with tooling and carving some of the heavier leather. 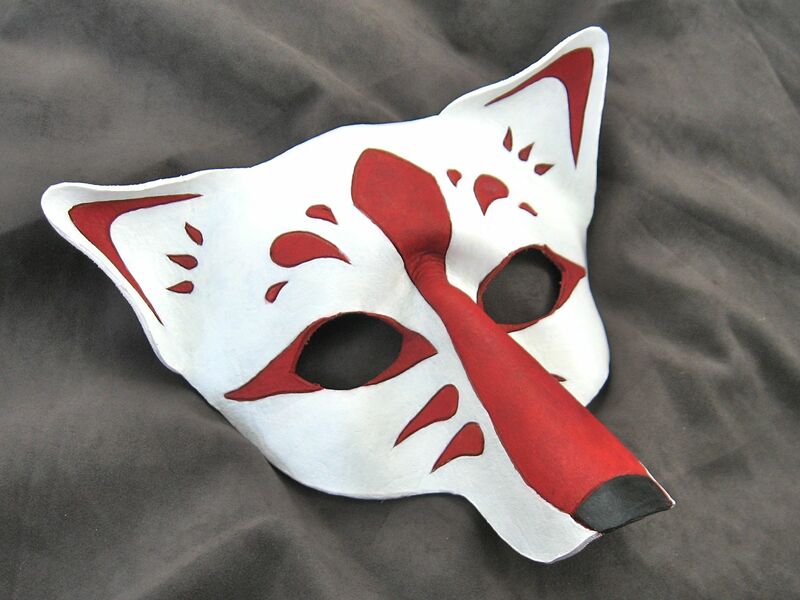 This mask is called “Inari,” after the Japanese god of foxes. 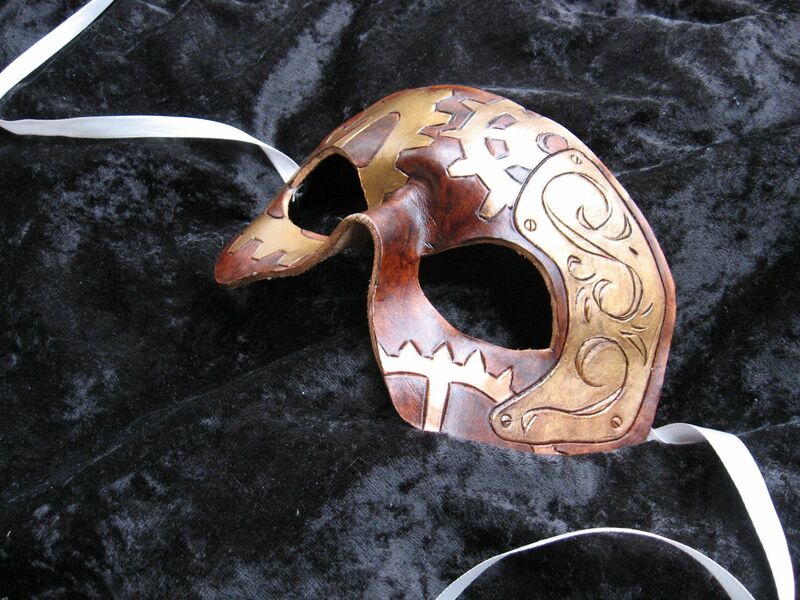 * The fox (kitsune) is a traditional character in Japanese masked drama, and I’ve tried to incorporate some elements of those classic character masks into my version. *The namesake of those tasty Inarizushi, because of his purported fondness for fried tofu. When I was growing up, you could always tell that the school year was winding up when the morning glories started to bloom. In Japan, their curling tendrils and brightly colored flowers are a symbol of summer. 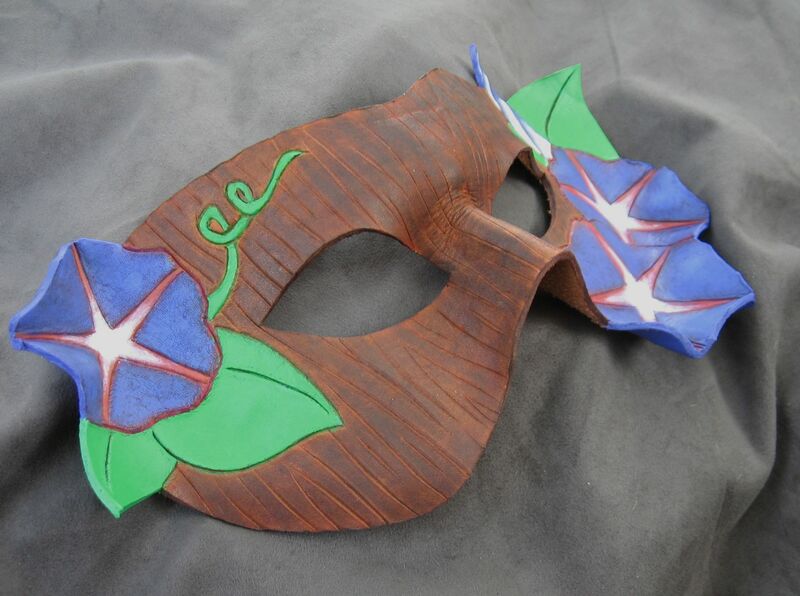 This mask depicts three bright purple blossoms against a tree trunk, with a fourth just starting to open. 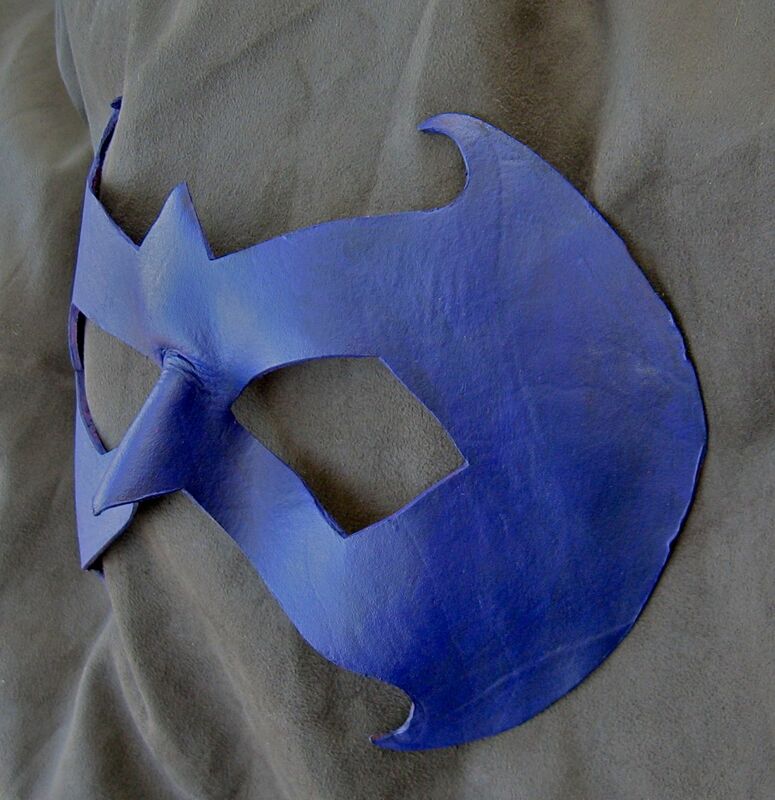 I wanted to try out some simple mask designs for tighter budgets, and here’s one of the results! 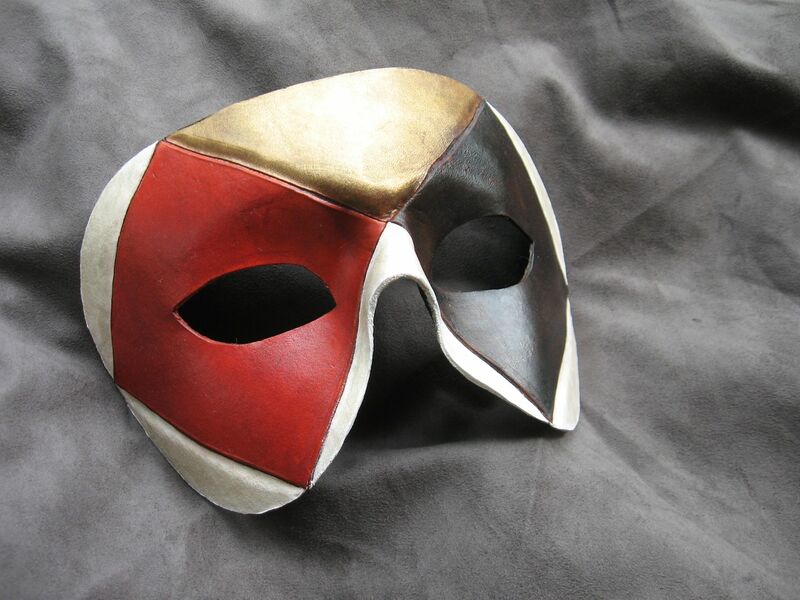 Black and red dyed squares, with metallic drybrushing in antique gold and pale champagne.